As Ethiopia’s long-running drought worsens, more than 10.2 million people now need food assistance for their survival and 48,000 children under five are suffering from severe malnutrition. The Ethiopian Catholic Church and Caritas are appealing for an urgent humanitarian response from the government and international organisations to help save lives. 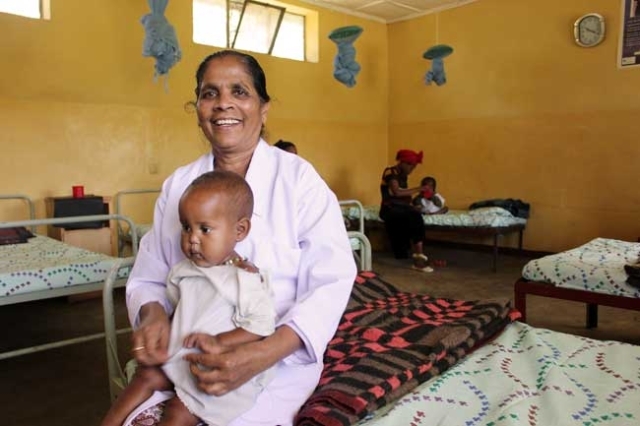 Muniva Haji Ahamed was afraid her toddler, Adilibara, would starve to death before she could make it to a Catholic clinic in southern Ethiopia. “It was like carrying a dead body, he was so limp, I feared that he would die,” Muniva recalled. The 32-year-old mother left a one-year-old baby at home and travelled 35 kms from her village to the Taza Catholic Church Clinc in Hosana, Hadiya Zone, to seek life-saving medical aid for her son. Dedicated staff at the Taza clinic gave Adildbari a ground nut supplement every four hours and later milk. They also treated the baby’s legs and testicles which were swollen from malnutrition. Adilibara may have recovered but the outlook is bleak for Muniva and her family. Severe drought has left them struggling to find enough food and water. Sr. Ceiline, from the Maids of the Poor Sisters, manages the Taza clinic which features a stabilisation clinic for malnourished children. The clinic treats between 150 and 200 patients a day, including 50 children. 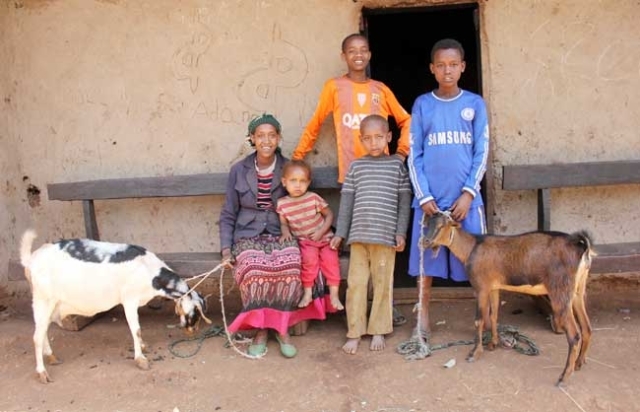 Woltelserhun’s children were treated at the Taza clinic for two months and with support from the UN World Food Programme she and her husband have been able to grow maize and use their goats’ milk to feed the children. Sr. Ceiline says funding from the government and donors has enabled the clinic to help more children but far more is needed to cope with the demand. A growing number of Ethiopians are being affected by the country’s prolonged drought which is expected to worsen in the north and west of the country due to the impact of El Nino, while the south is vulnerable to serious flooding also due to climate change. The Ethiopian Catholic Church is calling for urgent co-ordinated action to respond to the crisis and aims to support the delivery of food aid and ensure farmers have good quality seeds and hygienic water supplies in the worst affected regions. The Catholic Bishops’ Conference of Ethiopia says climate change and environmental degradation is having a devastating effect on people in nine different church dioceses and is the worst the country has ever seen. “The severity of the situation is continuously increasing as is the number of people affected,” said Cardinal Berhaneyesus D. Souraphiel, the Archbishop of Addis Ababa and president of the Catholic Bishops’ Conference of Ethiopia. Caritas Internationalis has launched an appeal to help the most vulnerable on behalf of Caritas Ethiopia. Cardinal Souraphiel said the emergency response was not only about providing emergency food assistance but helping to protect livelihoods and keep families together. “As Pope Francis states in ‘Laudato Si’, changes in climate to which animals and plants adapt, affects the livelihood of the poor, who are forced to leave their homes, with great uncertainty for their future and that of their children,” he said. Caritas Ethiopia has been working with diocesan offices to conduct food security assessments in different parts of the country since May 2015. It is also working with other Catholic Church structures and other organisations to help identify those most vulnerable to malnutrition, particularly young children, and to extend the provision of emergency assistance to those in need.